It's the first I've heard of a flooring trade show demonstrating commitment to social media marketing and I can't wait to experience it. 15 minute social media marketing focused educational sessions given by several of my favorite social media marketing friends. I'm delighted to be joining Todd Vendituoli, Mark Johnson FAIA, Arpi Nalbandian, Bill Buyok [read my interview with Bill Buyok], and Paul Anater who has been instrumental in catapulting Coverings into the digital world. Here is a link to the 15-minute sessions schedule. On Tuesday, April 17 at 4:00 pm. This is your opportunity to meet in person those tile and stone people you have been conversing with over Twitter. You can follow Coverings on Twitter and Coverings related happenings using #Coverings. On Wednesday, April 18 at 4:00 pm. 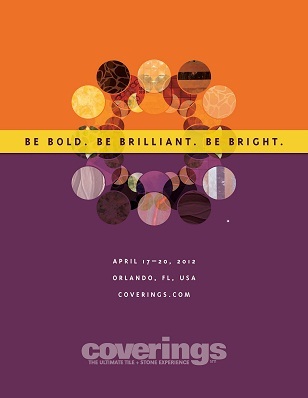 Be sure, too, to check out the new Coverings Blog! For more information, here is the release which details Coverings to put social media front-and-center of show. If you plan on attending Coverings 2012, let's connect at Coverings Central!